It’s been 20 years since I last turned it on. After plugging it in and flipping the switch, I smelled smoke so I quickly shut it off. I opened it up (6 screws) and removed a drive (4 screws) and pulled the controller card off of it (4 more screws). Then I noticed a blown tantalum capacitor, so I replaced it. Then I put it all back together again and powered it up with a bench supply (tantalum capacitors nearly always fail in a short circuit which makes things a little too exciting, so at least a bench supply lets me limit the current). 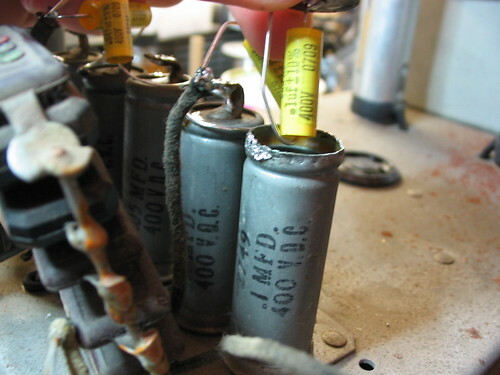 More smoke, and another blown tantalum capacitor. 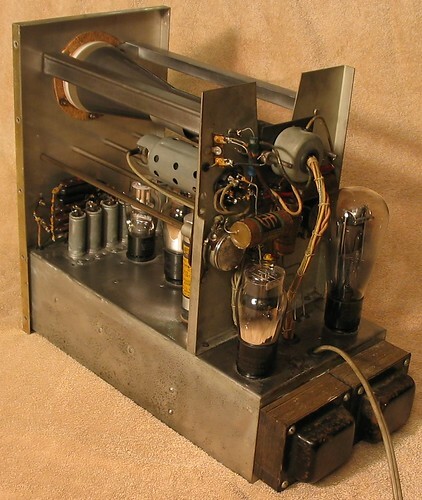 I fixed it and put it back together, and powered it up with the regular power supply. Closing the drive door made the motor spin up very sluggishly, so I checked and noticed the supply voltages were low. 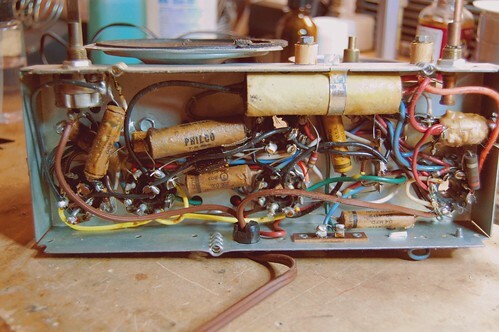 So I took apart the power supply and noticed a voltage adjustment potentiometer, so I set it back to the correct voltages and put everything back together. Now the motors seemed to run OK. I tried putting in a disk and closing the door, but the drive made horrible noises. The LED on the drive blinked and the drive spun down, essentially rejecting the disk. 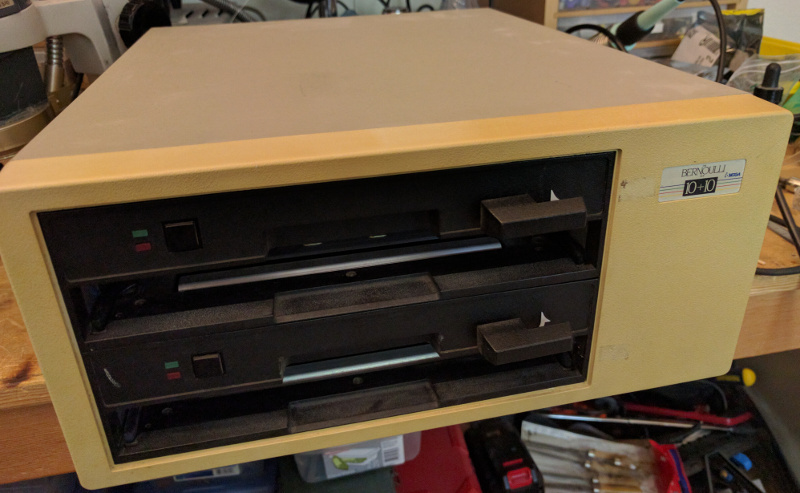 I figured out how to open the protective window on the disk cartridge, and noticed that there were bits of sticky crap on the disk, mostly near the hub in the center. Taking apart the drive, I noticed a rubber ring that is supposed to push down on the disk in order to create some friction to spin it up. The rubber had decomposed into sticky stuff that was getting everywhere. 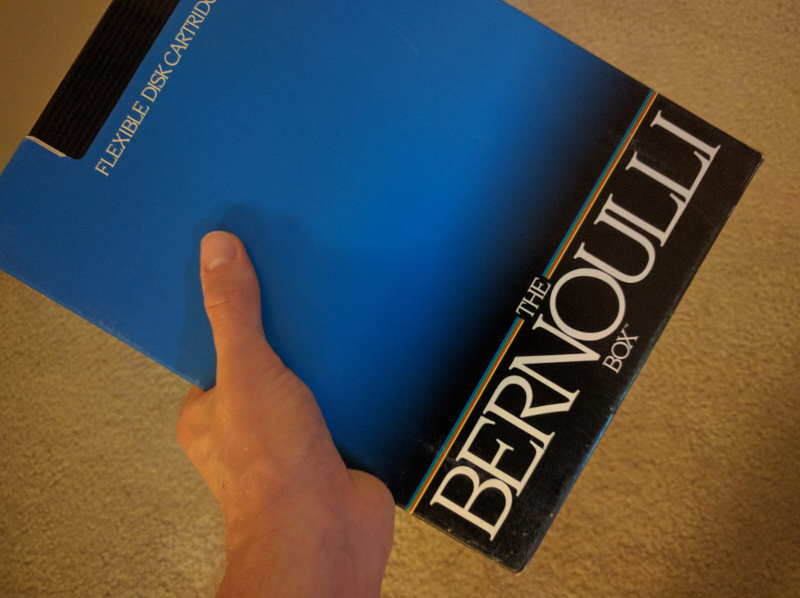 Bernoulli drives work on the Bernoulli principle. The disk itself is basically a floppy disk and is made from thin flexible plastic. There is a metal plate (the Bernoulli plate) that the disk spins up against. As it spins, the air in between the disk and the plate also spins and flies out due to centrifugal force. This creates a vacuum that pulls the disk very close to the plate, stiffening it so much that it acts like a hard disk platter. The drive head floats on an air cushion above the disk surface just like in a hard drive. Unlike in a hard drive, if any dust particles get pulled into the gap, then the disk drops away from the head and nothing is damaged. The metal plate and the head both need to be very, very clean for the drive to work correctly. They are actually mounted upside down so that dust will fall away and not settle. A large fan on the back of the drive (with an attached air filter) provides positive air pressure in the case to help keep dust out. Before it enters the gap between the plate and the disk, the air is filtered a second time by a very small filter located behind the drive head. In my drive, the head was filthy, the Bernoulli plate had some dust on it, and had a little oxidation on the back. I removed the oxidation with a file, with the idea that any patches of oxidation could produce problematic dust particles. I cleaned the working surface of the plate and the drive head with special no-lint wipes and 91% isopropyl alcohol. It’s very important not to disturb or distort the working surface, otherwise the disks will not spin right and could be damaged. I also fabricated a replacement rubber ring and glued it onto the top of the drive spindle. 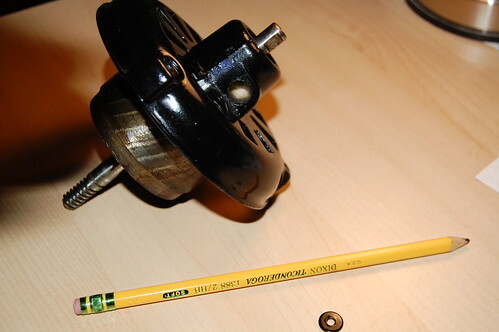 In the photo below you can see the spindle with the new rubber ring. The drive head is the white thing running in the slot on the upper left. 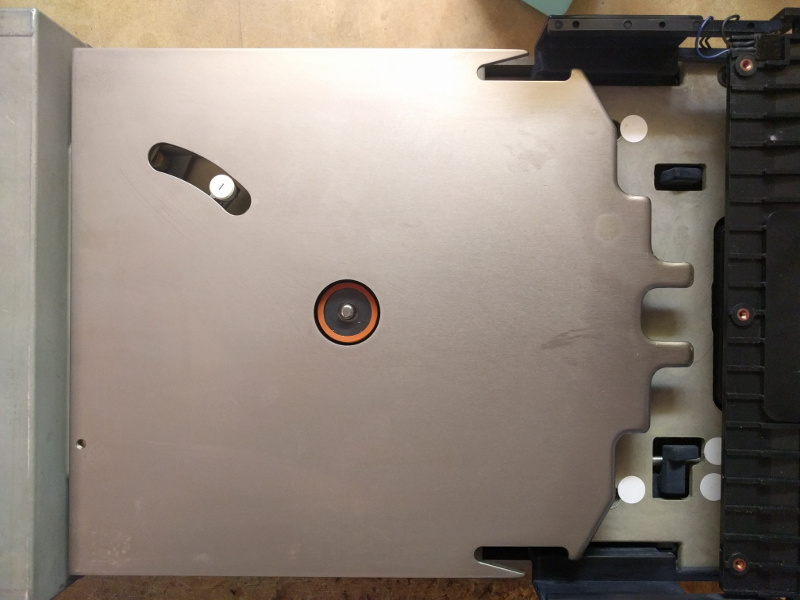 The cartridge enters from the right, and you can see some angular protrusions on the plate that open the cartridge and slide back the protective cover. Fortunately I still had the controller card and the cable, but I had no driver software. I managed to find the DOS driver on some random website, and it actually matched up and worked! I tried it with a different disk and I was able to read back data. A few data errors occurred, but they were mostly soft errors that a couple of retries could fix. I was also able to clean up the original disk using more wipes and isopropyl alcohol. It worked fine although it had some bad sectors. 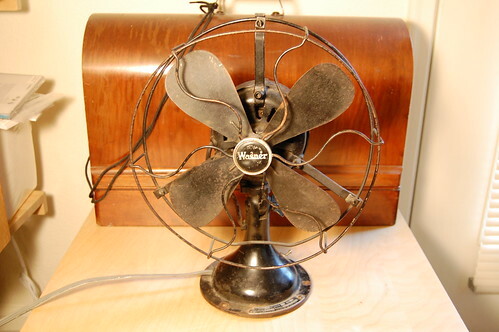 My Wagner fan restoration has progressed well (see previous posts). Recently I finished the final assembly. I took the entire fan apart and cleaned every part. 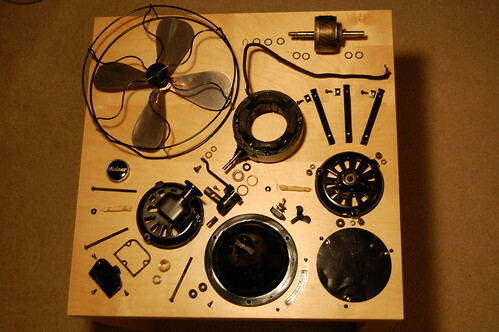 Many of the parts needed to be repainted, and the fan blade needed to be stripped of the paint and polished. Here are all the pieces laid out. Please click on the photo for detailed Flickr annotations. brittnybadger has taken some really great photos of household appliances in similar “poses.” I wish my photo was as good as one of hers. The oscillator gearbox looks really interesting. Here it is before I added gearbox grease. 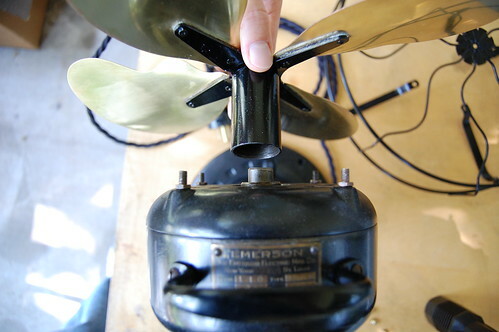 It takes the high speed rotation of the fan motor and slows it down using two worm gears, and then drives the crank which rotates the fan from side to side. There is still some work left to be done. The fan blade is made of steel which was copper plated before being painted. Time has not been kind to the plating. When I stripped the paint, I could see green corrosion and pitting that ruined the plating, so I had little choice but to polish off the rest of the copper plating. I have not yet decided whether to leave the blade steel or to get it copper plated again. Regardless of that I like the look of an unpainted blade. 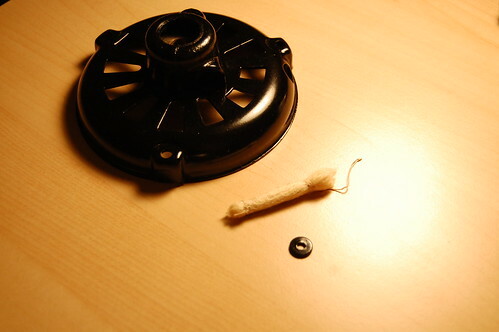 The headwire which connects the fan motor to the base and the switch also needs to be replaced. The rubber insulation underneath the cloth has gotten brittle and cracked. Similarly, the line cord is not original and I need to do some more research to find out what an original line cord looks like. Finally, I need to make some safety upgrades. I have already added a fuse in the base that will prevent shorts in the motor windings from causing a fire. I still need to add a grounding wire since the case is metal and could shock people if one of the motor windings touches it. 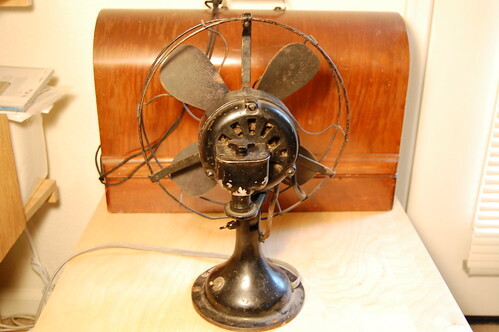 So you’ve obtained an antique desk fan, and you want clean it up and restore it, but you just can’t seem to figure out how to get the blades off. 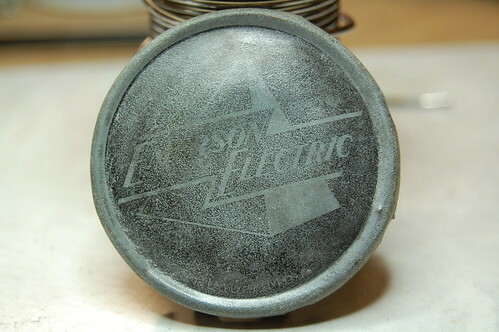 Based on a number of email inquiries, here are instructions for removing the blades from certain Emerson antique desk fans. 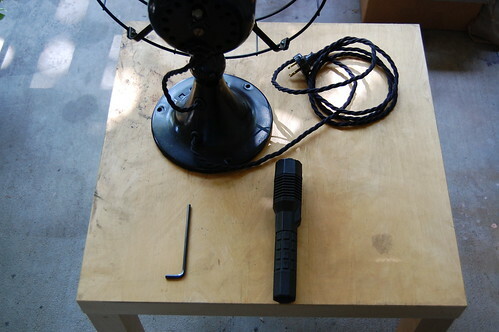 You will need some basic tools, including an Allen wrench, a flashlight, and a wrench appropriate to removing the cage. 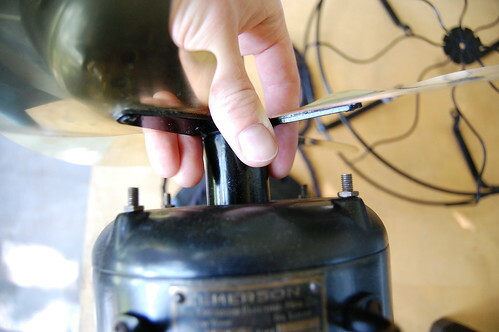 Before you begin, you’ll need to remove the cage so you have easy access to the fan blades. 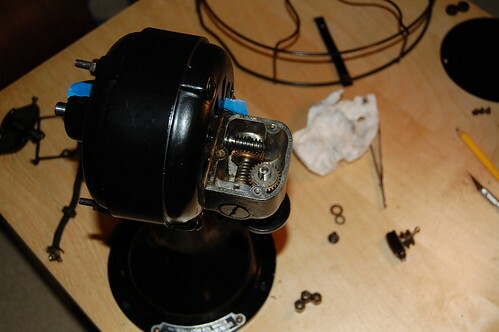 Usually that means you need to undo the four bolts holding the cage assembly to the front of the motor casing. 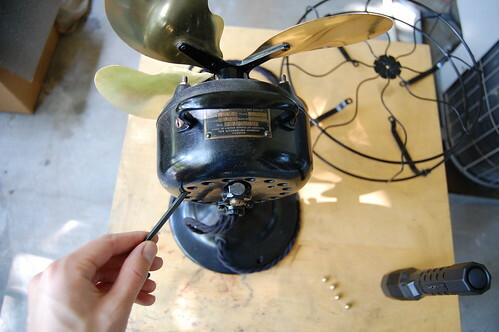 Next, you need to examine the rotor of your Emerson’s motor using a flashlight. 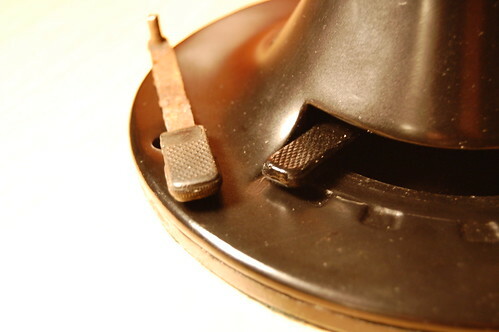 Look for a “blind” hole drilled into the side of the rotor. 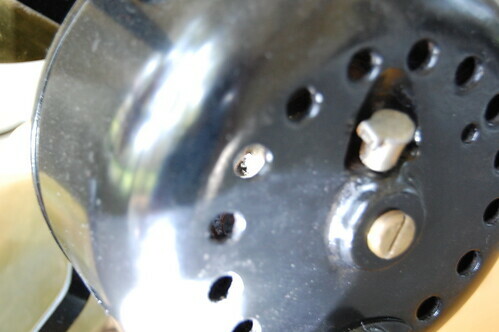 These are drilled by the manufacturer to remove some metal and balance the motor. 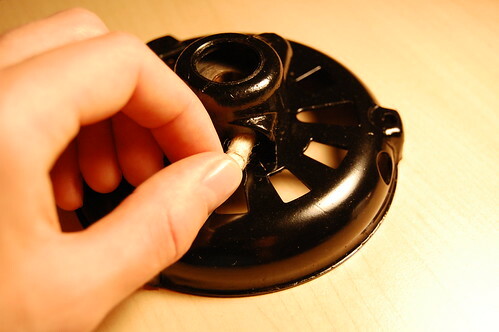 Once you’ve found the hole, insert the Allen wrench through one of the vent holes in the motor casing and into the balancing hole on the rotor. 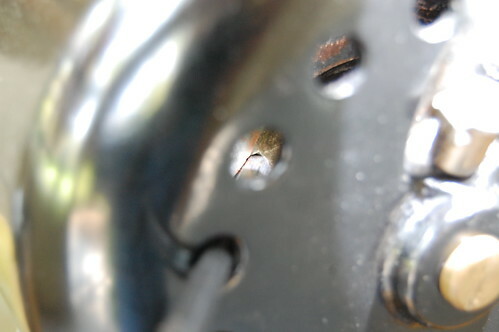 The next photo shows a closeup of the Allen wrench inserted into the balancing hole. When you do this, be very careful not to damage any of the stator windings. They are very fragile and protected only with a layer of cloth tape. 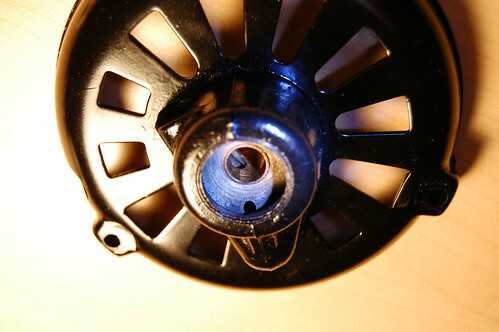 Once you’ve got the Allen wrench in position, grasp the fan blade by the blade hub (commonly called the “spider”). Yes, the blades will provide more leverage, but they bend pretty easily, and once you’ve bent a fan blade, it will never be the same again. 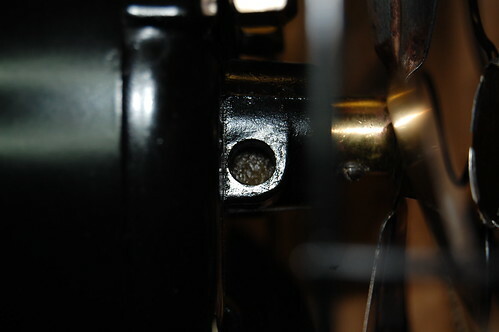 The threads fastening the wheel hub to the rotor are left-handed, so you need to spin the hub clockwise to unscrew it. The hub on my fan had frozen onto the rotor, and no amount of physical force would get it turning. I trickled some penetrating oil down the hub so it could get into the threads and free things up, but even after that I had to heat up the hub spindle with a heat gun. The heated metal expanded and broke the threads loose. It made a terrible squealing noise when I unscrewed it. And the blades are off! You’ll want to clean up the threads at this point to remove any crud or rust, and add some oil to make it easy to remove the blades next time. 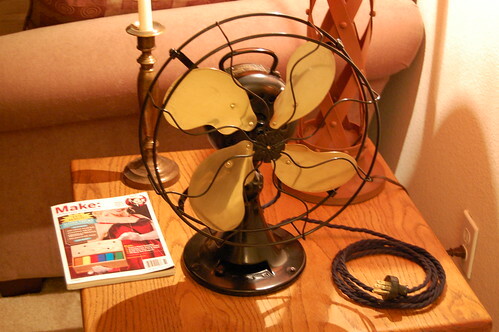 Restoring the antique fan also involved some safety upgrades. 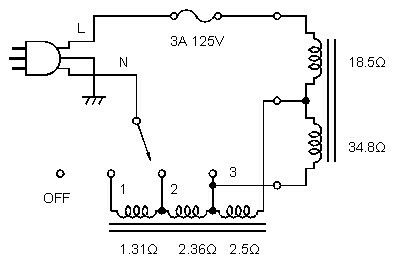 Along the way, I derived the schematic. 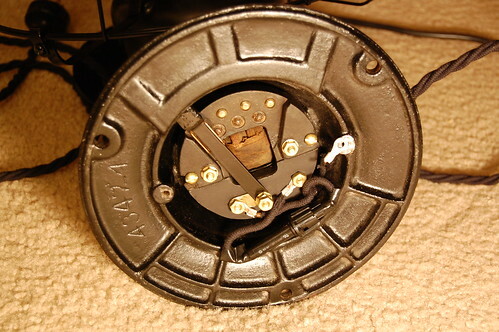 The motor has three connecting wires, but the trick was to figure out how the wires connected to the motor windings. I measured the resistance between each wire, assigning the wires the arbitrary designators A, B, and C. The resistance between A and B is 53.3 ohms, B and C: 35.3 ohms, and A and C: 19.1 ohms. Assuming the star configuration shown in the figure below, it’s possible to calculate R1, R2, and R3 as follows. R1 + R2 = 19.1, R2 + R3 = 53.3, R1 + R3 = 35.3, therefore (solving for R1, R2, and R3 using substitution) R1 = 0.55 ohms, R2 = 18.55 ohms, and R3 = 34.75 ohms. Clearly R1 is just the center tap and R2 and R3 are motor windings. This schematic shows two of the safety upgrades. 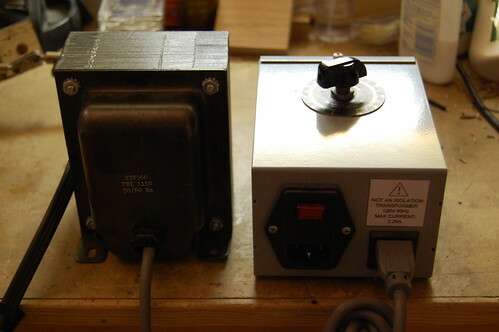 First, I added a 3-prong AC cable and connected the metal chassis to the safety ground. Then, I added a fuse inline with the AC hot. 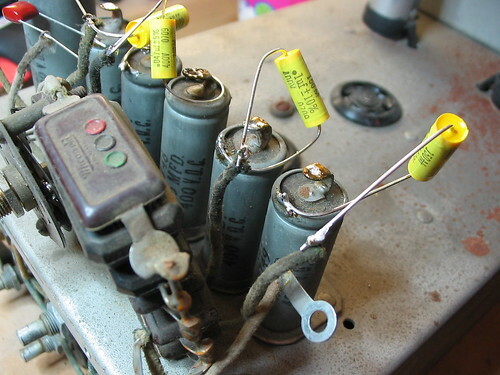 The fuse serves two purposes: it prevents a fire if the motor windings short, and it also will blow if the AC hot shorts to the chassis. Here’s what the underside looks like without the cover. 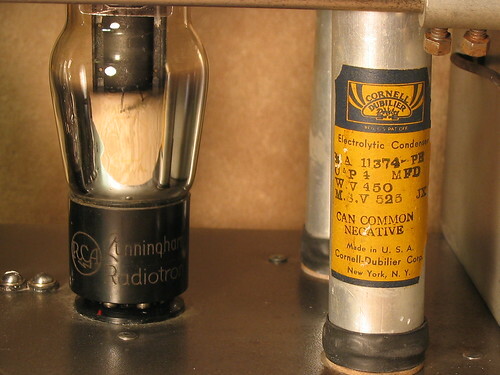 The switch contacts, the fuse, and part of the speed coil are all visible. 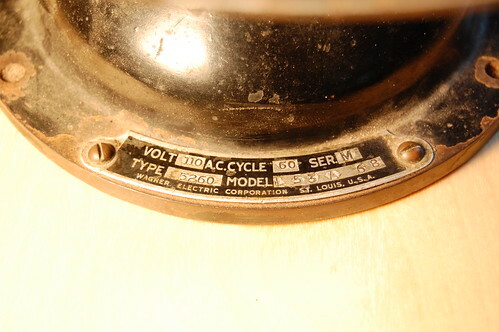 The original speed selector switch lever was metal, which was not very safe because the lever was connected directly to AC hot. Only the plastic knob prevented a nasty shock. I fabricated a new lever out of FR-4 fiberglass sheet. The knob itself was originally molded onto the metal lever and I could not remove it, so I made a new one by casting a replacement out of epoxy. 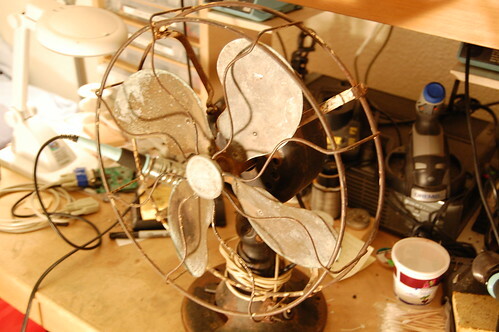 At the De Anza Electronics Flea Market, someone was selling a rather beat-up and rusty desk fan. 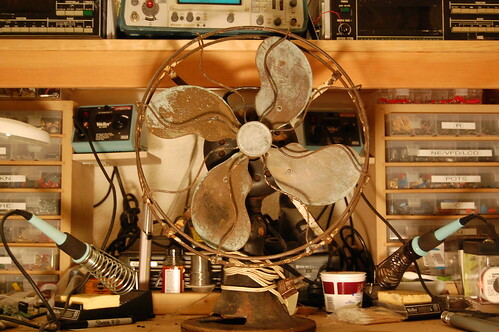 But it was no ordinary desk fan, this one was quite old. I had to have it. Later on, it looked at me plaintively from my workbench. 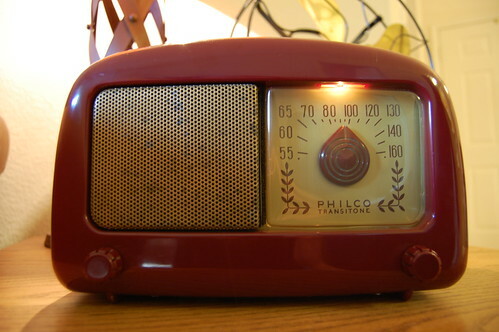 Suddenly it hit me–I had to restore this bedraggled-looking thing! It was a really long and involved process, taking me well over a month, but I have finally (mostly) finished. Why did it take so long? Well, for example, I found that the speed coil (basically a big inductor with taps for each speed setting) was slowly being eaten by rust. 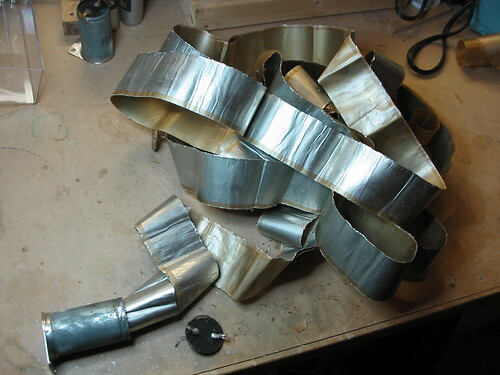 Thus began the arduous process of disassembling the entire coil, pulling apart the laminations, polishing off all the rust, varnishing them again (since the laminations must be insulated from each other), and reassembling the whole thing. All the work really did pay off. Here is what the mostly completed fan looks like. It’s fully operational. The cotton-covered twisted line cord I purchased from Sundial Wire. The plug is actually a standard item at OSH, believe it or not. I guess styles don’t really change much. The cord the fan came with was a more modern zip cord with a quick-plug, and the replacement plug is basically a 3-prong copy of the original. Why “mostly?” Well, the badge that goes in the center of the cage is pretty much beyond repair, and it also appears to be the wrong badge for this fan. The badge should be brass with a slightly different logo. Regardless of whether or not this badge is original, brass would look a whole lot better. I have been trying (and failing at) various brass etching techniques, since I have the CAD drawing of the logo already. Problem #1 is getting the toner transfer method to work. I have used magazine paper (an old issue of Nuts and Volts: my Make magazine issues deserve better!) and it really does not work for me, probably due to the amount of toner my laser printer puts out. Trust me, I tried a dozen times or so. Problem #2 is the actual etching process. Salt tank etching was a bit too faint, so next time I will try ferric chloride, which is usually used for PC boards, but should work for brass as well. Problem #3 is getting the etched brass sheet into the proper shape, which is convex in the middle with a rounded rim. Metal tabs in the back fold around the disc in the center of the cage to hold the badge in place. Previously I posted about a vintage Clough-Brengle oscillograph I obtained. It’s been a long process, but I’ve restored it to operational condition. One of the first steps in the process was to figure out what needed to be fixed. 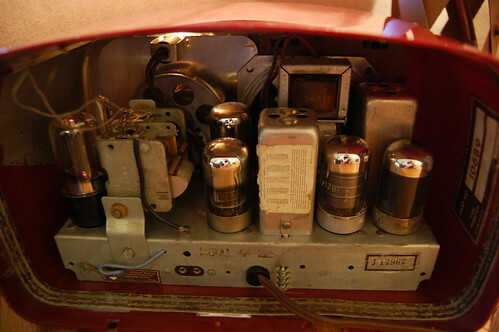 In electronics this old, the first thing I check are the capacitors. They were mostly paper capacitors which I just replace outright since they usually fail. 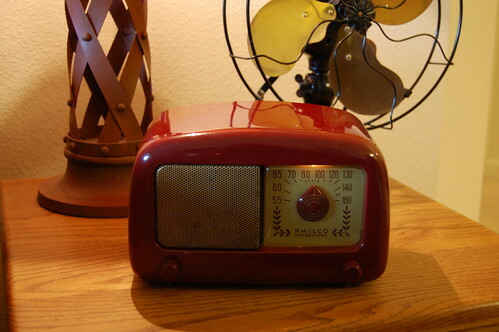 For this restoration project, I want to keep the vintage look as best as possible. 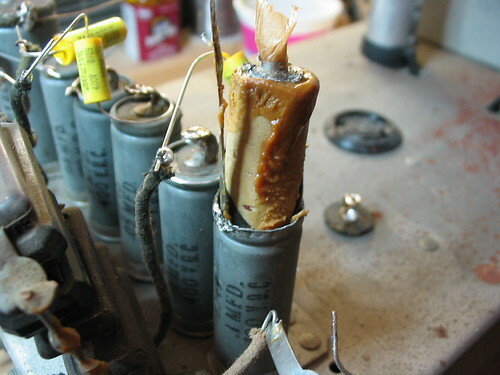 One way is to dress up the new capacitors in the clothes of the old capacitors. 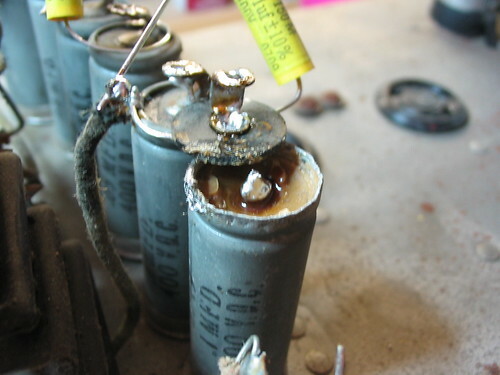 In this picture you can see the metal cans containing the old capacitors and the new ones soldered on top for testing purposes. 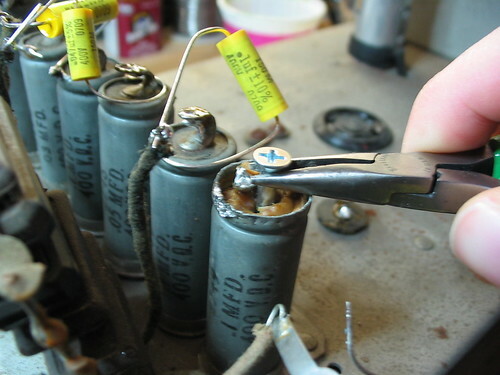 Here I have used pliers to bend the flange back and remove the “lid.” The stuff inside is a wax that insulates and holds the actual capacitor roll in place. The easiest way to remove it was to put a big wood screw right in and pull it out with pliers. Now you can see what the roll itself looks like. It’s actually Kraft paper (like a very thin version of grocery bag paper) that has been vacuum deposited with an aluminum film. Two sheets are rolled up together producing the capacitor. The Kraft paper is impregnated with oil to increase the dielectric strength. 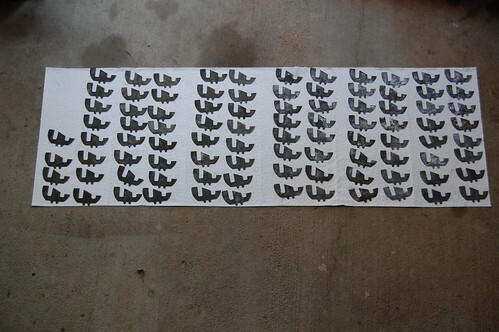 Here’s a larger one that I unrolled all across my workbench. Notice how much smaller the new capacitor is. This fits easily in the metal can that once contained the old capacitor. It was difficult to close the rolled metal lip without denting it, so it doesn’t quite look like the original, but it still beats ripping out the old capacitor or having the new capacitor squat on top like some sort of parasitic insect. After recapping everything, it was time to strip down the chassis and get rid of the rust. I got rid of most of it, although there was a lot of pitting and such left over. I used Naval Jelly which does a good job of converting the original iron oxide (ugly red rust that spreads like gangrene) to iron phosphate (which pretty much just sits there). 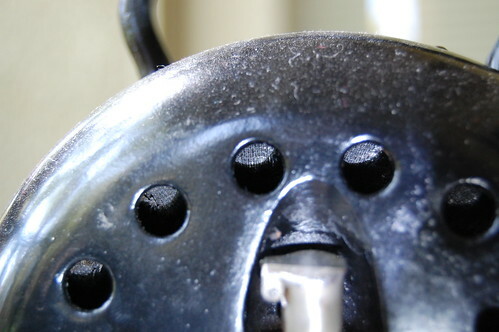 The grommets had all hardened and were crumbling off, so I replaced those as well. Here’s a closeup of the back. 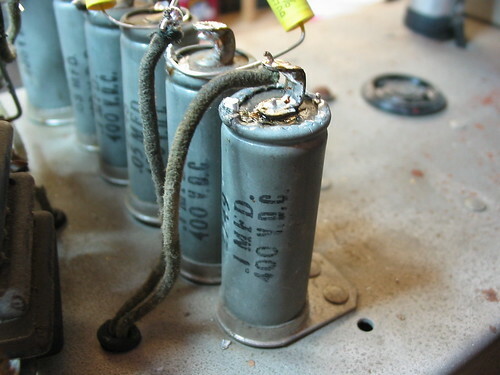 You can see a few cardboard-roll style capacitors which have actually been gutted and fitted with shiny new capacitors on the inside. I sealed the ends using the old wax. Speaking of capacitors, I also had to replace two big electrolytic filter capacitors. The insides were filled with hardened pitch which I had to drill out to make room for the new capacitors, which were about 1/10th the size. Don’t you like the label? This thing runs great now. I even dragged it out to the Maker Faire, but I didn’t plug it in for fear of wandering fingers (I left the cover off to expose the excellence inside).